This photograph is one of the most celebrated images produced by Brady, who established his reputation in the 1850s as the preeminent portraitist in New York and Washington, D.C. In the aftermath of the Civil War, Brady sought out General Robert E. Lee, who had returned to the Confederate capital at Richmond, Virginia, after his surrender to General Ulysses S. Grant at Appomattox Court House on April 9, 1865. 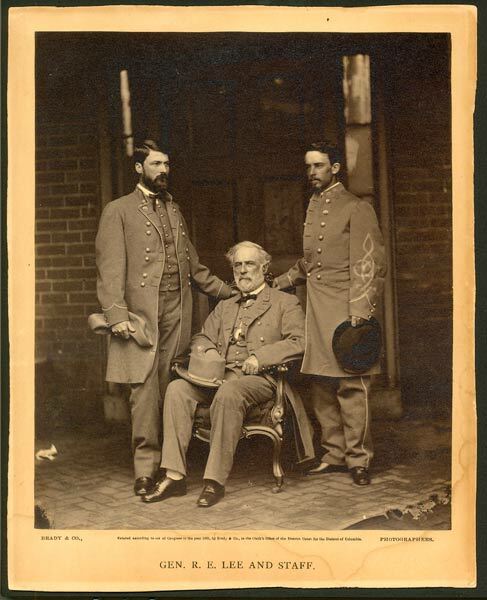 At the photographer's request General Lee reluctantly put on his uniform and posed at the back of his residence with his son, General George Washington Custis Lee (left), and his chief of staff, Colonel Walter H. Taylor (right). The image conveys the pathos of defeat for the Confederacy and for Lee personally. For Brady, who had been present at the first battle of the Civil War at Bull Run, this portrait completed his photographic coverage of the conflict.